I installed the new FreeBASIC-1.00.0-DOS. Cannot compile simple program. Keep getting error Msg F:\Fb_v1000\\lib\\dos\\i386go32: No such file or directory. The file i386go32.x is in the directory \lib\dos. Cannot even compile programs I was able to compile on FreeBASIC-.0901. It still works but not the new version FreeBASIC-1.00.0-dos. It will not even compile in Windows\Dos. I have been using Windows 98se in Windows XP as a dual operating system. 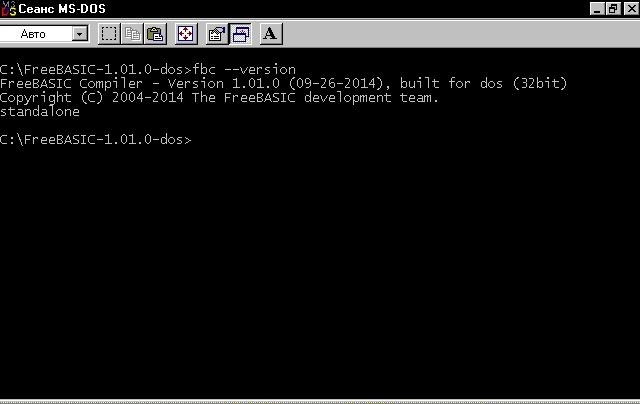 Is there something with the new FreeBASIC-1.00.0 dos program? I haven't seen this error myself (yet), but then again I'm testing on a Windows XP (in a virtual machine)... no "real" DOS. It looks like an issue with backslashes in the path to the lib\dos\i386go32.x file. This tells fbc to leave behind the temporary files it creates when compiling. I'd like to know the content of the text file "ldopt.tmp", which fbc uses to pass options to ld.exe (the linker). It should also contain the full path for lib\dos\i386go32.x which is used for linking. It'd be interesting to know whether fbc is producing the expected path in the ldopt.tmp file, or whether it's already wrong there. "ld: cannot open linker script file c:\\tools\\freeba~1.0-d\\lib\\dos\\i386go32.x :no such file or directory (ENOENT)"
I gave it the same argument I used for previous FBC Dos compiler, "fbc -lang qb gcs20a.bas"
My computer is a plain old, vintage, 14 year old Windows ME machine. Where can I get new correct fbc.exe? The output of "ld --verbose" might be helpful. Only the lines with paths in them. First, I compile git version using FreeBASIC-0.90.1-dos. When I recompile freebasic using compiled git version, I get error "undefined reference fb_cpudetect". I replace libfb.a from FreeBASIC-1.00.0-dos to compiled git version, and recompile. Sorry for my English, not native language. which basically just disables the \ -> \\ escaping on DOS because apparently it neither is needed nor works. I've simply removed the \ -> \\ escaping for DOS which seemed to have been the problem. I don't think we need the opposite \\ -> \, do we? I thought that the incoming paths are ok - the problem was just that they weren't written to the @ldopt.tmp file properly. It looks like the download links in the News forum post and on the Downloads page still point to version 1.00.0, which means I just downloaded the non-working version, installed it and spent some time fixing up my directory structure and copying source, etc., only to find this bug, search for it on the forums, find the link to the fixed zip file, download it again, etc. The new version 1.01 wasn't released yet; I'm planning to make the new release in December. In the meantime, it's possible that you can find builds of the development version of FB (which contains the bug fix) from other sources, for example here. > I installed the new FreeBASIC-1.00.0-DOS. Cannot compile simple program. Worx for me in both FreeDOS and EDR-DOS. Was there a silent update or did it always work? No, no silent update... weird though that it sometimes works, sometimes doesn't. I'm thinking that the \\ slashes and ld using those as-is is the problem, and it happens to work on systems which accept \\. So it seems like it works on Windows XP and FreeDOS, but not MS-DOS. FBC 1.0 DOS works well, most notably, it removes the 70 KiO of extra bloat added in 0.90, and the "FBC.EXE" file itself is also much smaller than in 0.22, thanks to the devels :-) After replacing the "binutils" by those from 0.22 (actually just "AS.EXE" and "LD.EXE" are sufficient) it still works without any warns.